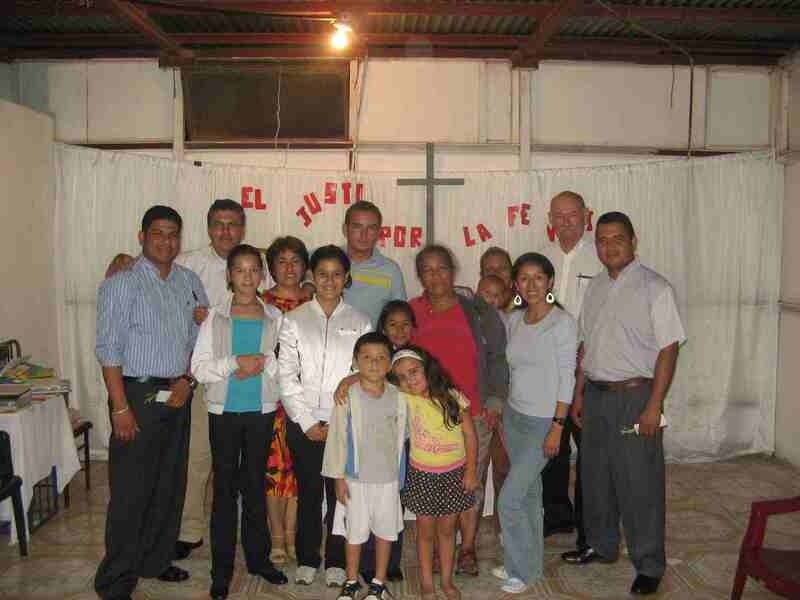 Pastor Edmundo (2nd from left) and Pastor Pedro (1st from right) with a few mission leaders. This past week I had the opportunity to visit with our two missionaries in Costa Rica and see firsthand the work being done in Casa Cuba, a barrio of San Jose and Cartago, a community about 23 kilometres south east of the capital. 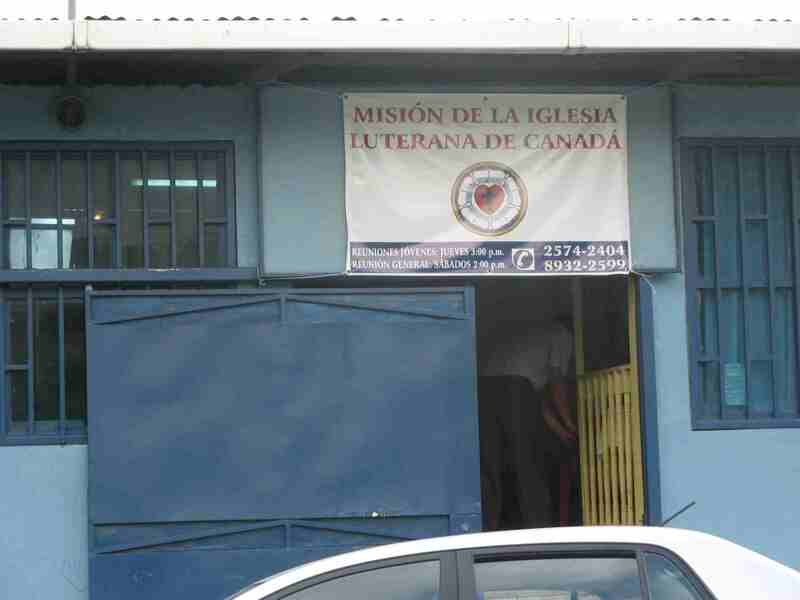 Work began in Cartago about one and half years ago with Missionary Edmundo Retana, our first Costa Rican pastor. His outreach program is a three-pronged approach. (1) Together with his wife and the assistance of others, they have outreach programs for children and teens in the area. These are held twice a week. (2) They seek to establish relationships by carrying out special events with invitations being sent to people from the community. These are always well attended especially if they involve their children. On the day of our visit, one of the special events was taking place. Approximately fifty crowded into our rented facility (thanks to Concordia Lutheran Mission Society who provide the financial support for both this facility and the one in Casa Cuba) to hear about an upcoming MOST Ministry Eye-glass clinic in November. After describing what would take place at the eye-glass clinic, he used the opportunity to speak about humanity’s need for spiritual sight and how that comes in the person of Jesus Christ. The teens handed out tickets for the clinic and Pastor Retana then visited with people collecting names and addresses so that he could have the opporutnity to speak with them personally in their homes. Since his beginning he has confirmed six adults and conducted one baptism. Worship is held on Saturday with an average attendance of 27 people. The time of worship is followed by programs for children and teens. Pastor Pedro Quintero, our Nicaraguan missionary in the country, has been serving in various barrios of San Jose. During our visit with him, we visited in Casa Cuba where he began work some 8 months ago. This outreach ministry has focused more on the children in the community and with the assistance of a resident from the community, he has been able to develop a children’s program that reaches out to about 30 children. “These are families that I have been able to now contact and share the Gospel with,” Pastor Pedro says. Pastor Pedro conducts his services on Sunday morning. They have about 20 people who attend regularly, a few coming from other barrios in which he has done work. On Reformation Sunday, Pastor Edmundo will be visiting and together they will celebrate the Reformation with a confirmation service. Pastor Pedro has also been conducting Bible Studies and confirmation on Thursday evenings. We are thankful to God that through the work of these two missionaries, three women and two men have been identified and now assist in the outreach of the Costa Rican mission. At least three of these people will be attending a future seminary program in Nicaragua. As a result the church in Nicaragua has requested that Pastor Pedro return to Nicaragua and has now called him to serve as Pastor of Cristo Rey Luterana in El Realejo and to begin an outreach ministry in Corinto. He and his family will return to Nicaragua in November. Missionary Edmundo with the support of these new identified workers will continue to work in Casa Cuba along with Cartago and with God’s blessing expand that ministry into other areas of the city. We thank God for the work of these two missionaries and pray God’s continued blessing upon the Gospel proclamation in Costa Rica. 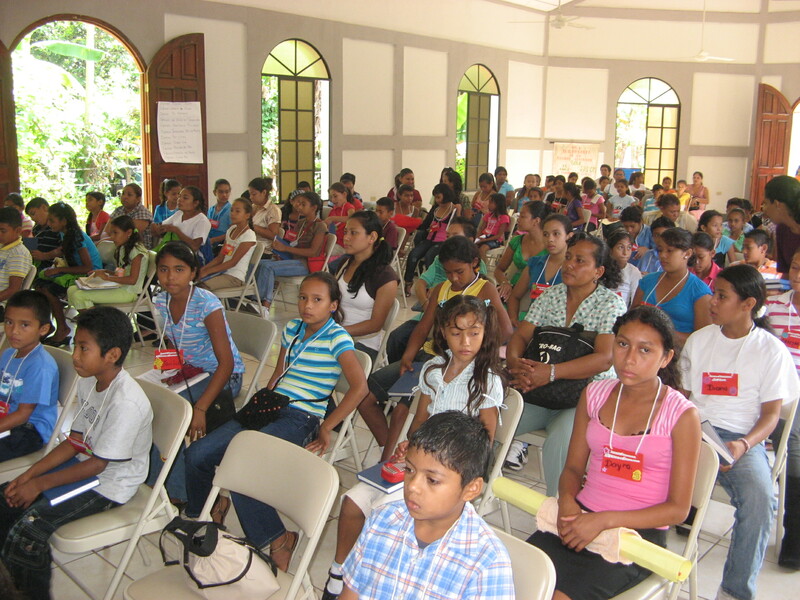 More than one hundred children and their deaconess teachers gathered in Martin Luther Chapel in Chinandega for the first-ever Children’s Reformation Celebration Saturday, October 9. Each congregation selected five children from their Christian Children’s Education program and made arrangements for them to travel to the event. The day’s activities, all led by different deaconesses of the church, included a devotion, Reformation presentation, Bible study and artistic crafts. Marco Antonio Martinez led the children in hymns and a variety of actions songs at various times throughout the day. From the enthusiasm of the children in their singing, this part appeared to be their most favourite. 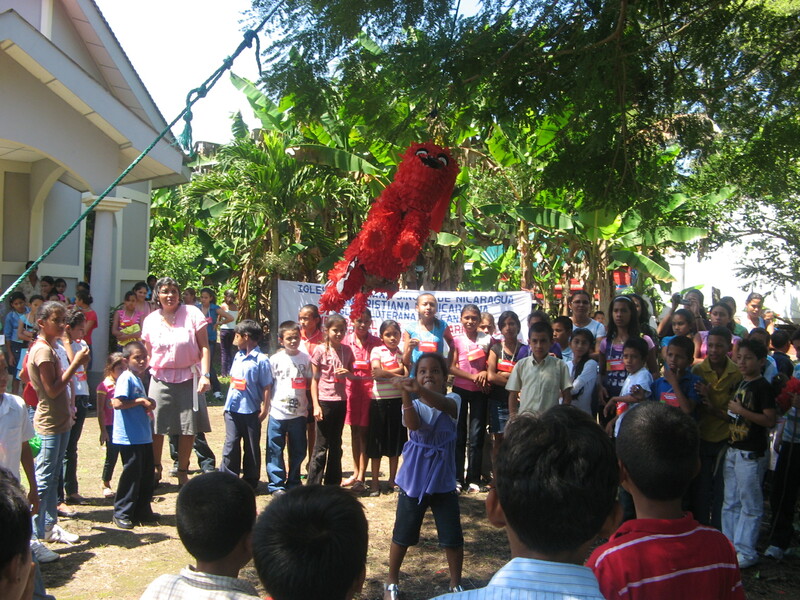 No celebration in Nicaragua takes place without piñatas for the children to break. This celebration had three on hand and the children released tons of energy as they broke open those piñatas to get the goodies inside. Before returning home, (some had a three-hour return trip) the children enjoyed a hearty serving of Gallo pinto, a traditional Nicaraguan meal. The day was a wonderful success; the deaconesses demonstrated their leadership and organizational skills and the children were enthusiastic in their participation. The first hour of this Children’s Reformation Celebration (which included the devotion, Reformation presentation and interviews with pastors and deaconesses) was broadcast live on one of the local radio stations. The church is using these live broadcast events as a build-up to the major church-wide Reformation Celebration to take place at the Mission Centre October 31. Please pray for God’s blessing on this outreach tool. Be prepared to share the hope within you! Never one to miss an opportunity, Rev. 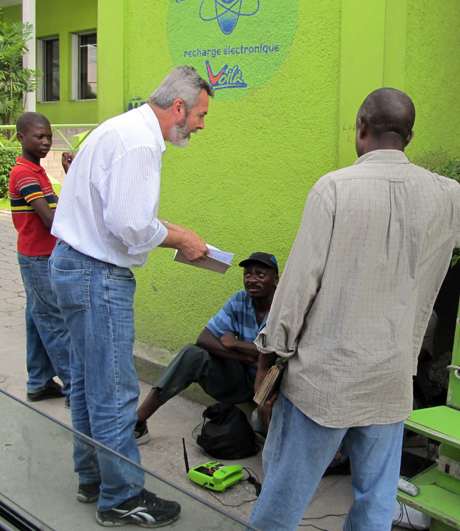 Dr. Leonardo Neitzel, Lutheran Church–Canada’s mission executive discusses the Gospel on the streets of Port-au-Prince, Haiti. He is currently there as a member of a review team assessing the ongoing relief work to which Lutherans in Canada contributed $1.2 million. What happens to quilts and We Care kits? Have you ever wondered what happens to those CLWR quilts you made or maybe those various CLWR kits you put together? It was my privilege to participate in the distribution of some of the Children’s Kits and quilts made available to us through a container received from Canadian Lutheran World Relief. Our travel took us first to Somotillo, about 65 kilometres north of Chinandega. There we were met by 38 children and their teachers. I shared with them the story of “We Care” and Canadian Lutheran World Relief and then reminded them of One whose care goes beyond anything that we could ever provide; the care of our good and gracious God and His love for us in Jesus Christ. I joined our Mission business manager, Roberto Jose Zepeda and our Synod president, Pastor Luis Diaz, in distributing first, the Children’s Kits and then a quilt for each child. Perhaps I distributed the one you made! On our return trip we stopped at another community, Villa Salvadorita. There 41 children waited for us. 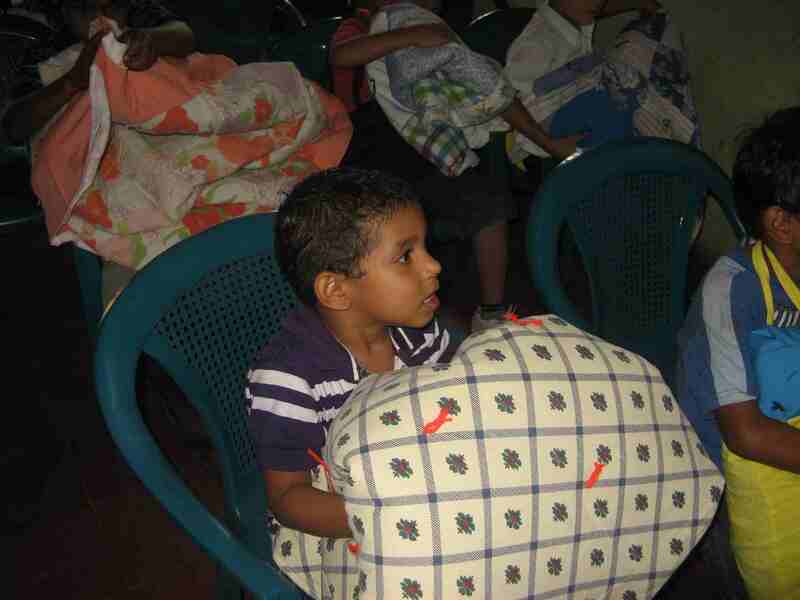 We gave kits and quilts to all of these children as well. These were just two of the 22 communities where we have distributed CLWR quilts and kits since we received the CLWR container in May. Deaconess Maria del Carmen Martinez and Deaconess Heyling Ordońez. I am reminded of the ladies of the Lutheran Women’s Missionary League-Canada (LWMLC), their commitment to Christ’s mission and their generous mites each time I enter the building that houses “Dorcas,” our LCC Mission Sewing School. 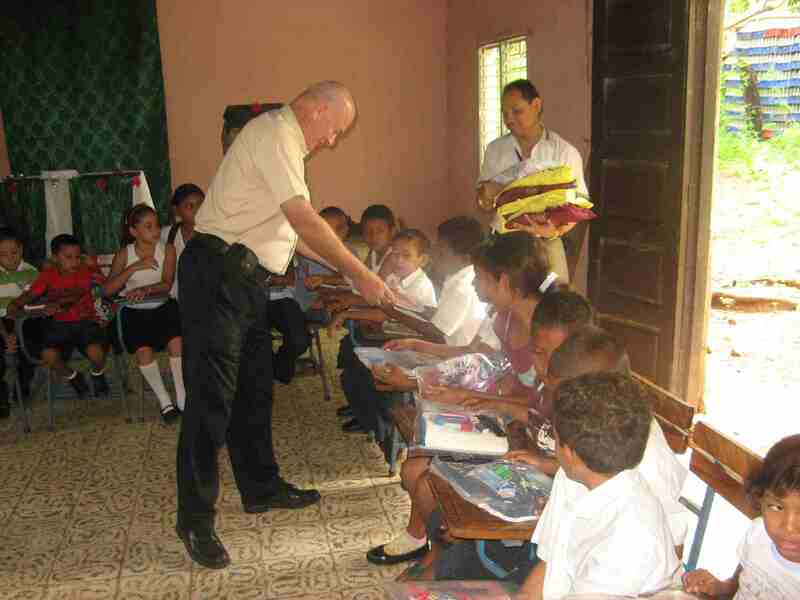 The school began in 2001 with an initial grant from LWMLC; each year those grants have continued to come and that has permitted the mission to keep this social ministry program going. The instructor for the program is Santos Alvir. To date some 70 students have graduated from the program. The school teaches design/pattern making and sewing to women (and some men too) who come with no marketable skills and in most cases are too poor to enrol in any other school. Their goals are lofty, they want to be able to support themselves and their families, but without this initial training, their chances of doing that are slim. It’s a joy to know that some of our graduates are now employed in one of the local clothing factories and others have opened little shops in their homes and now make and repair clothing. In October 2010, the mission will open its own small clothing factory and will employ at least three graduates. Our product will be the 900 “school uniforms” that we currently purchase each year for the Children’s Christian Education Program. The profits of this new business will help support the stipends paid to our pastors and deaconesses. 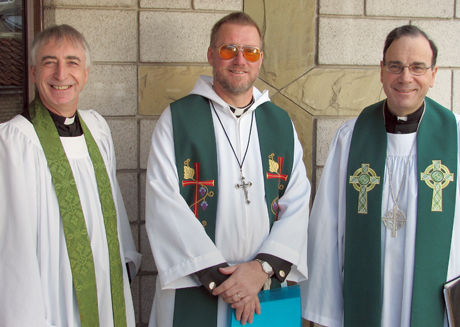 It is part of the overall program in assisting the church to be self-supporting. 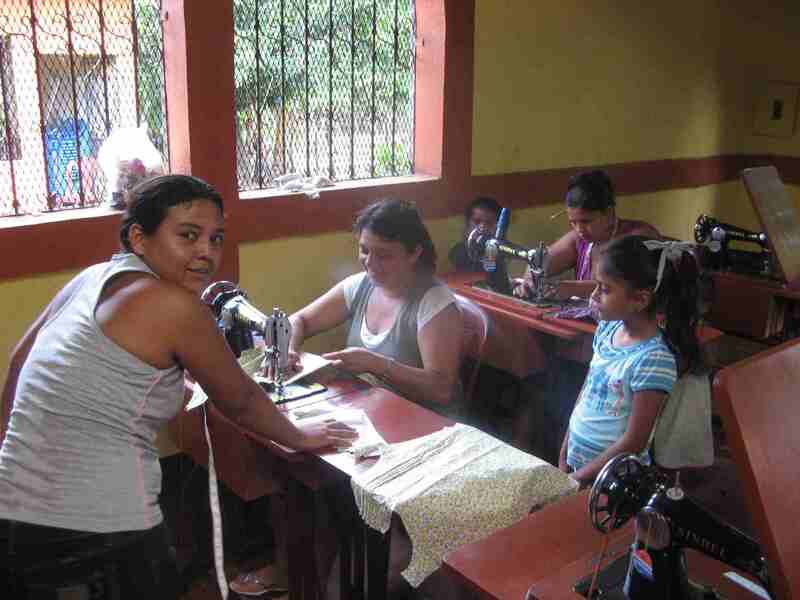 This past summer our “Dorcas” sewing school expanded its operation and now holds weekly satellite classes in Rancheria. On my visit to the school last week, I was introduced to 19 students; three of whom were just beginning. 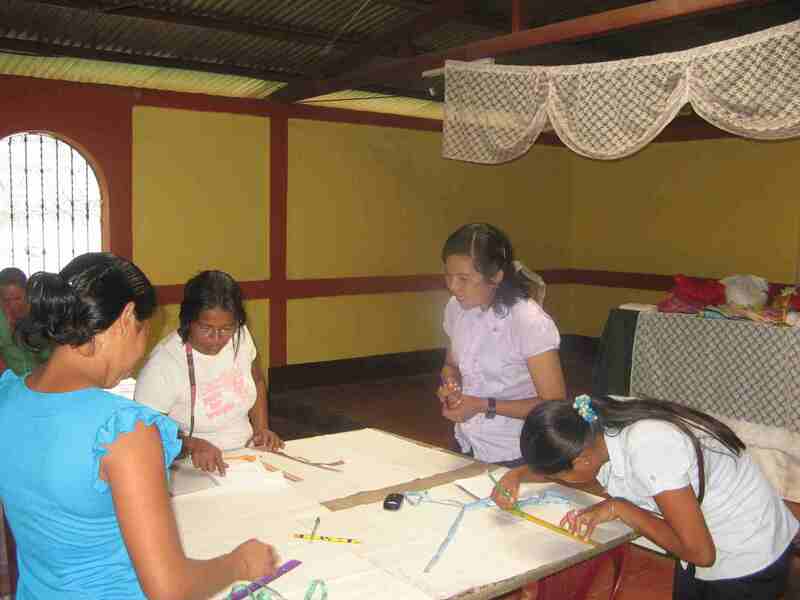 While they were receiving lessons in pattern making, others were preparing their initial project out of paper, while still others were at the treadle machines. I was pleased to see Edila, the wife of Pastor Marvin from El Viejo in the class. Two of our deaconesses from El Piloto were also learning the skills: Deaconess Maria del Carmen Martinez and Deaconess Heyling Ordońez. This social ministry project, as with other social ministry projects, makes contact with people at their human need and provides opportunity in this context to share grace and love of God with all the students. In the next several “On the Road” articles we will visit a number of social ministry projects operated by our LCC Nicaragua Mission. In this article, I introduce you to Dr. Rodolfo Mendoza, our Mission Clinic dentist. Dr. Mendoza graduated from the Faculty of Dentistry at the National University of Leon in 2004 and he joined our team at the Medical Clinic in February this year. It is my first visit since returning to Nicaragua. Dr. Mendoza has a wonderful smile on this face as he expresses his thanks for the new dental chair installed in the centre as well as other supplies donated to the clinic by Canadian Lutheran World Relief. It is much easier to operate than the old chair (a 1950s model) and much more comfortable for the patients. Dr. Mendoza arrives at the clinic each Thursday around 8:30 a.m. During his morning hours he sees about five adult patients. In the afternoons, he sees mostly children. This afternoon he saw six. Most patients, both young and old have problems with cavities. He fills them and provides a cleaning. There was a time when there were a lot more extractions, but now he sees fewer and fewer. He also spends time helping children and their parents develop good cleaning and brushing habits. Our Medical Dental Clinic opened on Easter Monday of 2009. On staff are Dr. Mendoza and our physician, Dr. Benjamin Garcia who has served here since the beginning. Our objective is to provide treatment for the pastors and deaconesses and their families; to provide on-going care for those whom visiting medical mission teams have identified; and provide clinic services to members of the community. In addition to providing the care of a doctor and dentist, the clinic tries to have any prescription medication on hand as most patients find it difficult to purchase their prescriptions. Theannual $10,000 medical clinic budget is supported by generous donations apart from the Synod’s mission budget. You are currently browsing the LCC On the Road blog archives for October, 2010.